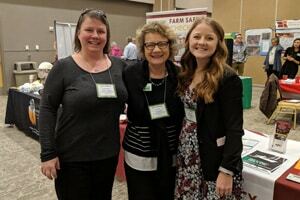 The 2018 Midwest Rural Agricultural Safety and Health (MRASH) was held November 27 – 29 in Council Bluffs, Iowa. Megan Schossow and Carol Peterson represented UMASH with an exhibit and three posters showcasing recent projects from the center. The theme for the conference was “Stressing Resilience”. Farmers juggle the uncertainty created by falling prices, increasing interest rates, public policy, land transfer, employee issues and many other external factors with the day to day responsibilities of getting their crops and livestock to grow. UMASH provided resources directly related to the topic with the Signs and Symptoms fact sheet and Farm Safety Checks focused on mental health and fatigue. 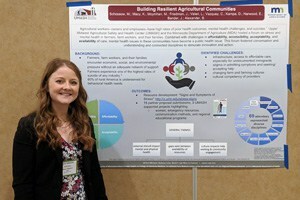 Megan Schossow presented her poster summarizing the 2018 UMASH Annual Forum on Building Resilient Agricultural Communities which fit in nicely with the overall theme of the conference. The MRASH conference is an opportunity to network with other ag centers and related professionals in the agricultural safety and health community. Sharing resources and learning from others makes all of us better prepared to work with farmers in stressful times.